You can think of business as a multiplayer game between the supply chains of different companies. Companies use their supply chains to lower operating expenses, offer new services and appeal to more customers. The competing supply chains of Walmart and Amazon are an example of this. In the 1990’s Walmart introduced new technologies and procedures that supercharged their supply chain and drove their growth. Now Amazon is introducing new technologies and procedures to again change how supply chains operate and supercharge Amazon’s growth. Companies that master the science and the street-smarts of using supply chains for competitive advantage see their customer base expand and their revenues grow. This calls for constant innovation with new technology and supply chain operations plus continuous improvement of existing operations. Managing supply chains has become an ongoing, multiplayer competition between different companies. We offer this multiplayer game not as a game to merely entertain, but as a game to engage you, and help you learn supply chain strategies and skills. What you learn by playing this game is directly applicable to the real world of supply chain management. Cincinnati Seasonings is the case study most people start with when they begin using SCM GLOBE. In the Cincinnati Seasonings case study you manage the supply chain shown in the diagram below. There is a factory manufacturing food seasonings sold as a packaged product called the “Spicy Cube.” In addition to the factory, there is also a warehouse and three stores, each with their own product demand and quantities of product on-hand. The objective of the case is simple: Meet product demand at the stores for 30 days while lowering operating costs and inventory as much as possible. This simulation and reporting concept can be used to create a multiplayer game composed of SCM GLOBE and Google spreadsheets. Google is used by many educational organizations and thus integrates with the .edu email accounts of both instructors and students. One feature in Google Sheets that Excel doesn’t have is the “=IMPORTRANGE” function. This allows different individual Google spreadsheets to be connected in the cloud. So if a change is made in one spreadsheet this change will appear in other spreadsheets that have the =IMPORTRANGE function set up properly. The multiplayer game gives every student their own Google Sheets workbook where they copy-paste the results from their SCM GLOBE simulations. Each player’s workbook is connected to the instructor’s workbook. When a student copy-pastes their results from SCM GLOBE into their appropriate sheet the results are automatically shown to the instructor and to all other players through the dashboard reports in each Google Sheets workbook. A diagram of this network is shown below. 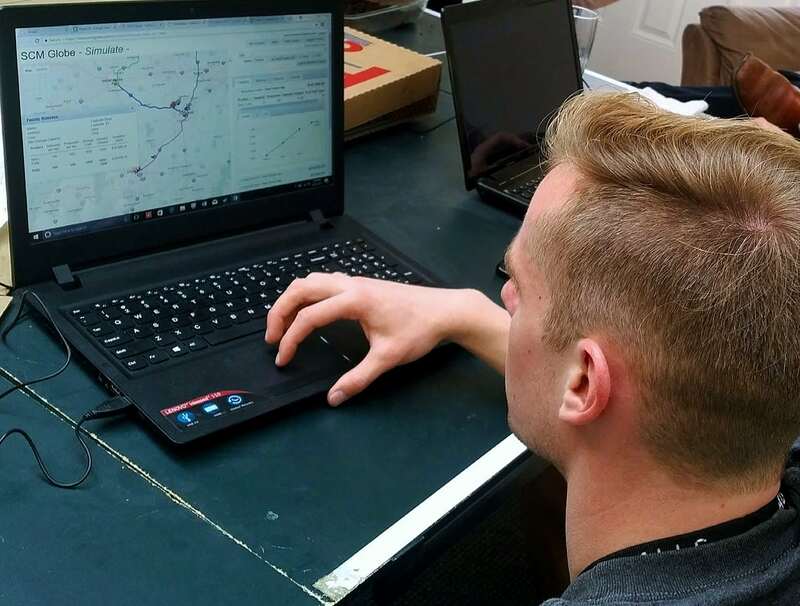 Through this process of connected spreadsheets we can create a simple competition where each player copy-pastes their results from their personal SCM GLOBE simulation into a personal Google spreadsheet that’s connected to every other player and the course instructor. This provides a live scoreboard showing each player’s gross profit achieved, and this is the metric used to judge the performance of each player’s supply chain. Whoever has the highest gross profit wins. The multiplayer game gives every student their own Google Sheets workbook where they copy-paste the results from their SCM GLOBE simulations. Each player’s workbook is connected to the instructor’s workbook. When a student copy-pastes their results from SCM GLOBE into their appropriate sheet the results are automatically shown to the instructor and to all other players through the dashboard reports in each Google Sheets workbook. The benefits of using a spreadsheet to enhance SCM GLOBE simulations is that many people know how to use a spreadsheet (compared to a programming language). People can edit the ideas shown in this article to customize their game if they wish. In the game, players work with a spreadsheet and a realistic supply chain simulator that can model any supply chain. Players can also open a new sheet in their Google Sheets workbook and build their own models to help them make decisions in the simulation, a skill directly transferable to their careers. Players use data from their supply chain model (demand from the stores, quantity on-hand of all facilities, production rate in the factory) and make their own forecasts in Google Sheets to aid them in their decision making. For example: Every store has a daily demand and a quantity of the demanded product in stock in the store. How many days will it take before the store consumes the storage it has? Knowing this is critical for determining the delivery schedules with the trucks. We don’t tell the player how many days of stored supply they have, but they do know what the quantity on-hand and daily demand in the stores and thus can figure it out for themselves. 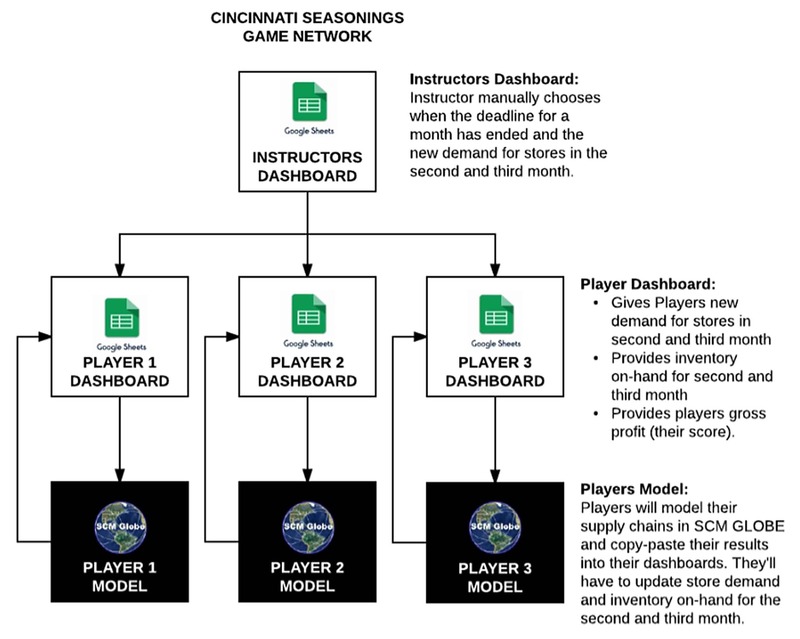 First month (1st turn) — players logon to the SCM GLOBE accounts and import the Cincinnati Seasonings case study from the SCM GLOBE online library. In this first turn every student will have the same store demand and quantity on-hand for the Spicy Cube product in all facilities. This is the original case study many students are already familiar with. Second month (2nd turn) — there are two changes: Demand at the stores, and quantity on-hand in all five facilities. Demand is changed by the instructor and the new store demand levels are the same for all players. The instructor can choose to have demand go up or down or stay the same at any of the three stores. Product quantity on-hand — each facility for each individual player will have different quantity on-hand amounts based on the decisions each player made in their first turn. Each turn runs for 30 days. Each player starts the second turn with the quantity on-hand they ended up with on day 30 of their first turn. Third month (3rd turn) — the store demand and quantity on-hand will change again based on the criteria mentioned above. The player that has the highest cumulative gross profit by the end of the third turn wins the competition. Adding three individual turns also adds an extra level of complexity and reality not found in the original Cincinnati Seasonings case study. Students cannot just think about one month, they need to think about creating a safety stock of products for the next month. But if the safety stock gets too high they see increases in their storage and inventory costs. And if they run their supply chain too lean and safety stock gets too low and doesn’t meet potential demand increases at the stores in the next turn then they suffer a financial penalty. The game doesn’t advance into the next turn until the instructor makes the decision to move on, this allows all players to move along at the same pace. In the first turn the instructor sets some basic financial penalties. If a player makes a mistake or tries to cheat by not entering the correct demand numbers at the stores and quantity on-hand amounts at each facility then they suffer a financial penalty. For the second and third turn the instructor can change the demand at the stores to go either up or down, and players type in those new demand numbers. The instructor can also request players to submit a copy of their supply chain models in order to spot check simulation results reported by the players. We recently tested the game with a group of students in Provo, UT. These were students who got together with Eugene Sheely (writer of this article). The group was comprised of about half undergraduate and half graduate students. All were business majors. One was an industrial engineer working on a minor in supply chain management. Otherwise none were supply chain students. The first challenge was to quickly convey how to use the SCM GLOBE software. That didn’t take too long, about 20 minutes. We talked about the app and players logged on and scanned through the short videos and tutorials in the “Getting Started” section. Once people got the basic idea of the four entities (Products, Facilities, Vehicles, Routes) and saw how to use them to create supply chain models, they were able to start working with their supply chains and running simulations. Feedback from this test showed us where to make some changes to the user interface in Google Sheets, but the basic game mechanics were found to be solid. One player got stuck looking at instructional slides and the dashboard in Google Sheets and wouldn’t start playing. He kept asking, “How am I to run a simulation if I don’t know what would work?” Other players already playing the game told him the point is to run simulations again and again until you figure things out by correcting problems in the supply chain. But this student wanted to find the perfect answer first before he would start working on his model. He was afraid to get a wrong answer in the simulation. This approach does not take advantage of the learning experience the simulations offer. People cannot develop their understanding of how supply chains operate unless they try things out and let the simulations show them how their ideas will work. The game period can be set from several hours or to as long as the instructor feels is appropriate. For example, players can have one hour (or a whole day) to complete the first turn, then two hours (or two days) to complete the second turn, and one and a half hours (or whatever the instructor feels is appropriate) to complete the last turn. One notable aspect we saw was that players who completed their simulations started to compete with each other when they saw each other’s results in their scoreboards in Google Sheets. In the regular Cincinnati Seasonings case study students usually stop interacting with their supply chain simulation once they’re able to make it run for 30 days. But when individual scores were made public for all to see, players went back and studied their supply chains and found ways to lower their costs. All the while they were laughing and having a great time as they saw the changes they had made update their scores and beat their competition.